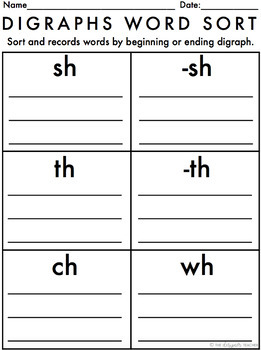 Engage your students and provide needed decoding and spelling practice by using this word sort as a group center or independent work task. This product includes two versions so that you can easily differentiate-- there are 24 picture cards with words included, and 24 cards with pictures only. 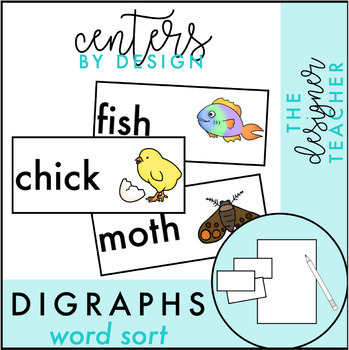 All students able to write and recognize letters will be able to sort and record the written words by digraph, while more advanced students can sort the picture cards and spell the words themselves. Product also includes a simple-to-use recording sheet. 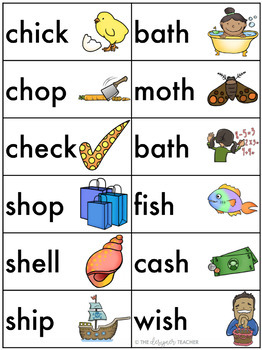 As in all my products, the fonts are clear and readable, and the images are easily recognizable-- perfect for students with IEPs and ELLs.